Our local food coop in Brooklyn organizes monthly cooking classes with students from the Natural Gourmet Institute. It’s a fantasy of mine to attend this school one day, but for now I’m happy to attend these monthly classes and learn from the culinary masters. 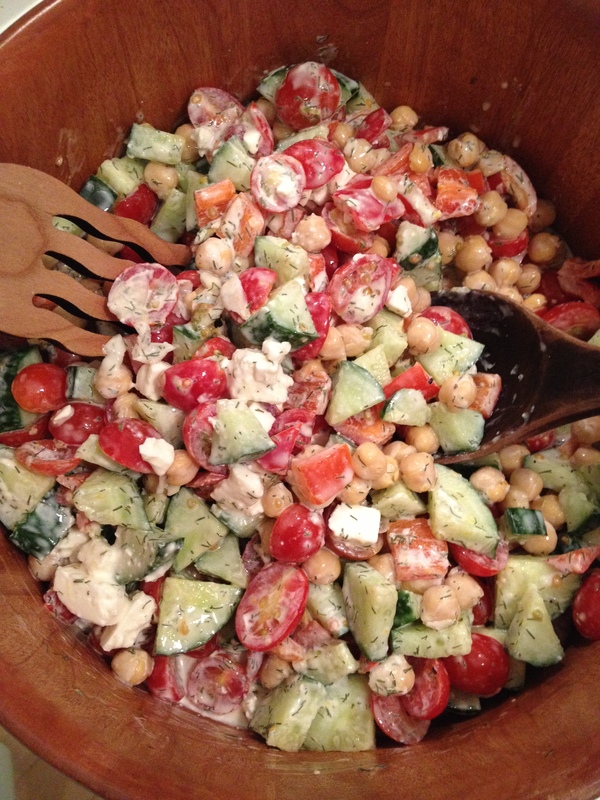 Recently, we were shown how to make this delicious Greek (or Mediterranean inspired) chopped salad and here’s my version of it. It’s so fresh and perfect for picnics and summer gatherings and will be sure to impress your friends. I love this kind of summer cooking: using the freshest ingredients with the freshest of flavors. The original recipe calls for sour cream but I think it makes it too rich and I love the tangy taste of Greek yogurt here. This salad has beautiful notes of lemon and dill and tastes just like a Greek summer holiday in a bowl. Enjoy! Mix the Greek yogurt, zest and juice of lemon, dill and garlic together in a small bowl. Set aside for 10 minutes so that the flavors mingle beautifully together. Add sea salt and black pepper to taste. Chop cucumbers and tomatoes. Rinse the chickpeas. Chop the feta cheese. Place in a large salad bowl. Pour over the yogurt dressing and toss. Let it sit for 10-15 minutes before serving.